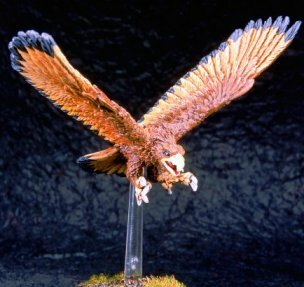 Colonel Marbles Miniatures Showcase - Eagles !! 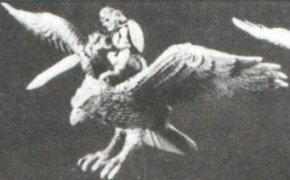 The purpose of this webpage is to offer possible alternative miniatures to use for Eagles and Hawks in your army as well as (or even instead of) those produced by Games Workshop. This is a really nice figure I have in my collection, sculpted by Kim Graham. No rider, but easy to add one. Well proportioned and in keeping with GW's offerings. A bit tricky to get hold of as I think the line is discontinued, but if you look hard enough they are not impossible to pick up. This is an excellent figure. Note they are the size of GW Hawks - they fit in with them superbly well. Sculpted I think by Mark Copplestone. Currently unavailable I believe, but hopefully will be re-issued soon by em-4. This is another great figure. My comments on the Hero above apply here also. This is a reasonable figure - this is the best/only image I could find of it online sadly. From Mithril's LoTR/Hobbit range. Detailing isn't the best, but serviceable enough. Difficult to find these days. Discuss miniatures on the Frothforum !